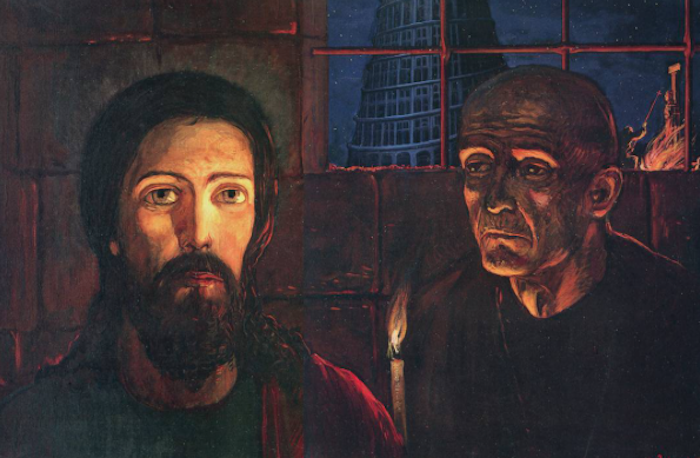 Exiled during the Soviet Union, awarded the prize of People's Artist of the USSR, a vocal supporter of the reconstruction of the Cathedral of Christ the Saviour, Ilya Glazunov's life was one of controversy, purpose and great achievement. Born in St Petersburg and attending the Repin Institute of Painting, Sculpture and Architecture, his first solo exhibition took place in Moscow, having won the Grand Prix of the International Competition of Young Artists in Prague in 1956. Best known for his enormous canvases filled with historical figures, Glazunov's works include portraits of famous Russians, illustrations for works of Russian literature as well as religious depictions of Russian history. In his most famous work, The Mystery of the 20th Century, Glazunov depicts an atomic bomb exploding over Nikolai II, Albert Einstein, John F. Kennedy, Vladimir Lenin, Adolph Hitler and Charlie Chaplin, with an image of Christ hovering above and Alexander Solzhenitsyn adorned in prison clothes. The work was completed in 1976, and for the ideological crime of depicting the Nobel prize winning gulag writer, Glazunov was sent to Siberia to paint portraits of the workers of the Baikal-Amur Railroad. After the fall of the Soviet Union, Glazunov's work found greater success and public appreciation when, in 2004, a museum of his art and his personal collection of icons opened opposite the Pushkin Museum of Fine Arts. During his lifetime, he also won many state and foreign awards, including the State Prize of the Russian Federation, the People's Artist of the USSR, and the UNESCO Gold Medal for “outstanding contribution to world culture”. Glazunov died on Sunday 9 July, and will be buried in the Novodevichy Cemetery in Moscow.